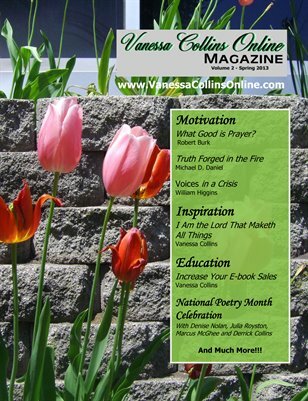 Welcome to the Spring 2013 edition of Vanessa Collins Online magazine. This Christian based publication is packed with articles that are truly inspirational, motivational and educational. We cover everything from praising God to how to save at the grocery store. We feature veteran writers as well as some new and upcoming talent. This edition includes: What Good is Prayer? (Robert Burk), Truth Forged in the Fire (Michael D. Daniel), Voices in a Crisis (William Higgins), I Am the Lord That Maketh All Things (Vanessa Collins), Increase Your E-book Sales (Vanessa Collins). We are also celebrating National Poetry Month with Denise Nolan, Julia Royston, Marcus McGhee and Derrick Collins and much more.